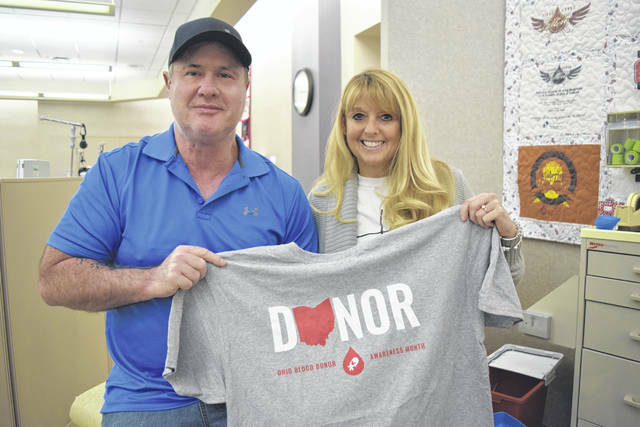 WEST LIBERTY – In the summer of 2016 total strangers came to the aid of Scott Boyd – rescuers, doctors and blood donors – and saved him from dying in a farm accident. Two years later, with his road to recovery still long and steep, a visitor emerged from out of Scott’s past to give him a needed push. And just as unexpectedly, that friend disappeared. Tragedy, invincibility and redemption are reoccurring themes in Scott’s remarkable life story. As a teen he cheated death in a car accident that killed three friends. As a dad he broke his neck diving into a pond to rescue his daughter. No challenge compared to what happened on Aug. 12, 2016, the day he nearly bled to death in the field behind his West Liberty home. He jumped off his bush hog to clear a piece of brush and was caught in the mower blades. The “shark bite” wound to his side, shattered his hip and shredded ribs and internal organs. By chance, Scott’s wife, Cindee, was home for lunch that day. She got a dropped call from Scott’s phone and sent a text “need anything?” She saw “help” and “911” in his scrambled reply. Scott’s heart stopped twice waiting for CareFlight and twice again in flight to Miami Valley Hospital, Dayton. Before take-off rescue workers asked if they should wait for Scott’s young son Noah to cross the pasture to hug his dad. They thought it would be a final goodbye. He had cheated death once again, but now he was bargaining to reclaim pieces of his old life. Lost memory, the stamina to walk, drive a car again, lift weights, or ride an exercise bicycle. And always more testing, more doctor visits, more surgeries. Months of delicate work went into preparing his body for an artificial hip. His hip bone began growing at an abnormal rate, requiring radiation and surgery. A damage nerve in his leg requires yet another surgery. But to Scott, his biggest milestone came in June of 2018. “Riding a bike,” he said. Before the mowing accident he would take to the road on a three-wheeled recumbent bike. Getting back on that bike was life-changing. Butch Sower and Scott were a year apart in high school. They were fast friends and both liked fast cars. But it was Butch who had the natural speed and strength of a champion long distance runner. He was a track and cross country star who led West Liberty-Salem High to back-to-back state championships. After high school fast driving and hard drinking became a struggle for Butch. He moved away and never married. Scott, who was married with four children, lost touch. After multiple DUI convictions Butch served time in jail. Butch was behind bars when he received news from home. He made it the starting line for his personal road to redemption, and his unique role in Scott’s recovery. Butch could no longer drive cars, but he would run miles to get where he wanted to go. He bought an old bike and challenged Scott to ride with him. Butch was a talented carpenter and Scott asked a friend to give him a job. Butch had not stopped drinking, but seemed to have it under control. He never missed work, stayed out of trouble, and kept running and riding with Scott. A week later the two men made a choice that Scott will forever regret. The summer night of Aug. 29, 2018, was two years since Scott’s accident. The sun was setting, but they decided to go for a late bike ride. Butch must not have seen the dead turtle, lying in the lane on Route 287. By either hitting or swerving to avoid it he was thrown from his bike. He was not wearing his helmet and he suffered a severe head injury. Just as in Scott’s accident two years earlier, he was flown to Miami Valley Hospital clinging to life. There was no miracle recovery for Butch. He died less than a week later. Scott can’t explain why he is still here and Butch is not. Scott’s road to recovery isn’t truly complete. Surgeries remain, and his mind and memory still play tricks, leaving him confused. More confusing is why a friend, so earnest about turning his life around, is suddenly gone. Butch did have a final mission, or as Scott might say, “one more kick.” The champion long distance runner was an organ donor. In his final days, Butch sought to help a friend, whose life was saved by blood donors. In death, Butch shared that legacy by giving life to total strangers. Mark Pompilio is Public Relations/Marketing Associate of Community Blood Center.